SEVEN Island beaches have lost their ‘recommended’ status for bathing in the latest Good Beach Guide — just two weeks after the Isle of Wight was placed joint top in Britain for its number of quality beaches. Of the 16 Island beaches tested, Gurnard, Ryde West, Shanklin, Totland Bay, Seagrove, St Helens and Whitecliff Bay all slipped off the list. However, all seven achieved a basic pass and Southern Water and the Isle of Wight Council said every beach met European standards for bathing water quality. The bathing water tests, carried out between May and September last year, coincided with the seventh wettest British summer on record. With so much heavy rain, John Spence, Southern Water’s head of wastewater and environmental strategy, said run-off from roads and farmland or storm overflows entering the sea could have affected standards. “We are pleased that, despite the rain, beaches on the Island again met the European standards. This success compares with just 41 per cent of beaches meeting the same standard in 1988, when South Water began a multi-million pound programme of work to help,” he said. The Marine Conservation Society (MCS) published its Good Beach Guide for 2009, after testing 777 UK beaches. Across Britain, recommended beaches fell by almost a sixth — the biggest annual fall in the guide’s 22-year history. The society believes specific counter pollution measures are required now, including new farming practices, investment in sustainable urban drainage systems, a significant expansion of the sewer system, to handle large volumes of storm water, and end-of-pipe monitoring on combined sewer overflows. • The Isle of Wight recently received 14 awards in the Keep Britain Tidy Blue Flags and Quality Coast Awards (QCA) — putting it joint top alongside Torbay, Devon. • Ventnor and Sandown beaches have both been awarded prestigious blue flags, while 12 beaches have been given QCAs. • QCA criteria includes good access, top facilities, such as lifeguard provision, being litter free and having clean bathing water. Similar criteria is also required for blue flag status, although the water quality test is more stringent. • MCS Recommended is the only scheme focusing entirely on water quality standards and risk of sewage pollution. THE Isle of Man has come off worst in a survey of beaches in the British Isles. 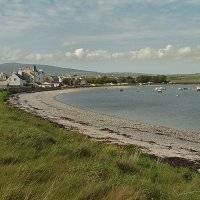 Derbyhaven was the only beach in the Isle of Man to have been recommended for its water quality in the Marine Conservation Society’s Good Beach Guide this year. Of our 18 beaches tested, 14 received a basic pass while a further three failed to meet the European Convention’s mandatory water quality standard. They were Garwick, Gansey and the Broadway stretch of Douglas beach. The European Convention’s mandatory water quality standard is the legal minimum standard of levels of faecal waste and bacteria that indicate presence of pollution from sewage. Other parts of the British Isles faired better than the Island for the number of beaches it had recommended by the MCS. The North West of England was ahead of the Island, achieving seven recommended beaches out of 34 tested. Northern Ireland had seven recommended out of 23 and the Channel Islands had 11 out of 29. However, the total number of beaches recommended overall was down 16.5 per cent on last year, meaning there will be 370 beaches making it into the MCS’s Good Beach Guide for 2009 compared with 444 for the 2008 edition. Derbyhaven was again the only one recommended in the Island last year. The overall number of beaches failing to meet the legal minimum standard was also up this year to 78 compared to 53 last year. Thomas Bell, MCS coastal pollution officer, said that the overall result was due to last summer’s heavy rain which swept waterborne pollutants like raw sewage, petro-chemicals and farm waste into rivers and the sea. However, he suggested that the Island’s poor water quality results came down the IRIS sewage treatment works not delivering. Mr Bell said where a beach failed, significant amounts of bacterial contamination were found to be in the sea in at least two of the 20 tests carried out at the locations. ‘I wouldn’t go swimming in a beach that failed. The risk of catching something is, for me, unacceptable,’ he said. He added that water quality was letting the Island down. The MCS said the Island has yet to see the real benefit to its beaches from the IRIS sewage scheme, which came on stream in 2004. ‘It is still not delivering the bathing water quality improvements that MCS expected from a facility costing an estimated £170 million — about £2,300 per person. The north and west of the Island have yet to be connected to the system and this means that raw sewage is still being discharged into the sea at a number of places around the Island, including Peel,’ the MCS said. But Transport Minister David Anderson said the MCS had got its facts wrong about the IRIS scheme and stressed the scheme was delivering results. In particular he said the amount spent on IRIS to date was £88m, not £170m. He said while it was true that the north and west of the Island were not yet connected to IRIS, but this was being addressed by the IRIS regional strategy, which the department is progressing at the moment. ‘Prior to Meary Veg (treatment plant) coming online in 2004, the failure rate of our beaches, when looking at the mandatory cleanliness levels set out by the EU’s Bathing Water Directive, was 54 per cent,’ said Mr Anderson. The Good Beach Guide is produced by MCS, a charity dedicated to the protection of the marine environment and its wildlife. The guide provides information about the quality of Britain’s coastal bathing waters as well as information on water quality and sewage discharges at 1,000 British Isles beaches. I’m not surprised to hear about the Broadway stretch of beach and water.. It’s a mess! If I was a fish I’d be growing legs and learning to walk! Interesting. One of the places I WOULDN’T swim on the Island is at Derbyhaven – the stink from the seaweed at times is so horrific it would put you off your picnic! Would much prefer to swim and picnic at Laxey or Fenella at Peel. How totally embarrassing and unacceptable to be bottom of the pile and how unfortunately not surprising at all. Shame but thankfully Martin Clunes did not go swimming! Re Beach Cleanliness, The article fails to address the issue of the debris on the islands beaches, most notably the plastic flotsam and jetsam that wash up all around the islands shores that are an eyesore as one walks around the island’s coastline. Why doesn’t one of the island’s government department simply hire some of the unskilled unemployed and get them cleaning it all up. As to the seaweed/smell issue – why not simply scoop all the decaying seaweed up and compost it – let the local farmers collect it. Seaweed is a phenomenal source of minerals and nurients that would benefit much of the agricultural land on the island. Dr John Pilling, your ideas are good, only one problem, you are asking Government to THINK! Life’s a Beach isn’t it! If I was afish I’d been in breadcrums or batter in the chippy. With Sellafield opposite the IOM what about the Nuclear waste drifting across the channel That must add to the unclean beach debate! However the gains with it are the giant Crabs and other weird sealife ,there could be a Manx version of Godzilla waiting To emerge from the depths. Our government needs to provide answers to how they are going to sort out this mess and make sure we have better results next year. Some members of the public also need to change their habits to get our beaches clean, namely; a) if you flush a sanitary towel or cotton wool bud down the toilet it will end up on our beaches. b) If you let your dog foul on the beach, the tide does not make it ‘magically’ disappear. c) The Marine Drive coastline is a moronic place to dump your unwanted bicycle, fridge or takeaway.